A one-of-a-kind modern office space perfect for any forward-thinking company. 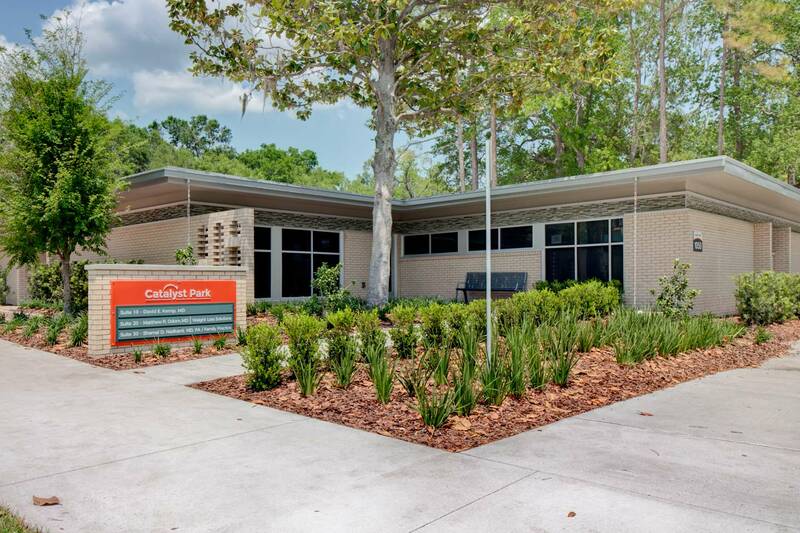 WHAT IS IT: A two-story luxury office building ideal for progressive companies who desire a location in the heart of Gainesville's central business district. WHAT'S COOL ABOUT IT: Businesses benefit from a state-of-the-art workplace which encourages collaboration, creativity and teamwork through its open floorplan and unique, contemporary design. WHERE IS IT: Innovation Square, the city's dynamic tech and research district situated between UF and downtown. The 107 office building is positioned in Innovation Square, the city’s cutting-edge region where dozens of flourishing tech startups have recently established headquarters. Your company will be situated between the University of Florida campus and downtown, giving you premier access to resources and talent from the top-ranked college. You'll be close to a network of other successful, growing companies, as well as local entertainment and restaurants in downtown. 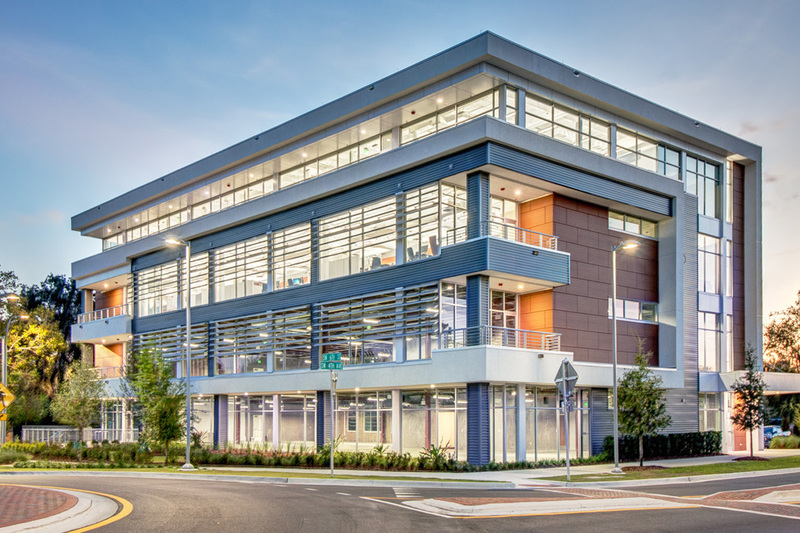 There is no better location in Gainesville to locate your business than at 107 in Innovation Square. Employees at the 107 will located walking distance to Gainesville's highest-rated restaurants, cafes, and bistros - so they can conveniently recharge during break and quickly get back to work. Over 6,000 of the sharpest minds in Florida graduate every year from the University of Florida. 107 is positioned in an ideal location just steps away from campus, making it easy for companies to recruit these graduates into full-time employees. The 107 office building is a contemporary, two-story luxury office space ideal for a company which thrives off of collaborative energy and teamwork. This isn’t your traditional, cubicle-filled workplace: this office offers businesses the perfect balance between open work areas and private breakout suites. Creativity flows and innovative ideas bloom as employees bounce ideas off each other in the open, communication-friendly work spaces located on each floor. When it’s time for a group meeting, employees can head to the spacious downstairs conference room which boasts a unique, glass-front roll-up door overlooking a cozy fenced-in patio. The upstairs features two private offices, perfect for executive suites or a location for smaller meetings. Employees will also enjoy a modern kitchenette and serene outdoor garden area. The building’s exterior itself exhibits a striking modern appearance, blending together cool wooden and metal accents with beautiful lush landscaping. Modern interior design elements such as exposed ductwork, stained, polished concrete floors and an abundance of windows for natural light create a comfortable, contemporary atmosphere. If you are a forward-thinking company looking to grow your business in a luxury office space near the heart of campus, the 107 office building is perfect for you. 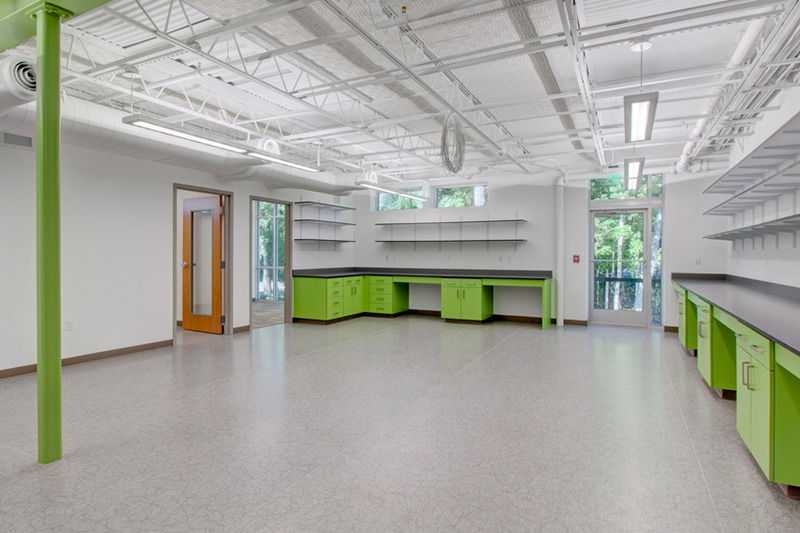 The two-leveled 107 Building provides the perfect compromise between open work areas and private offices. The first floor comprises of an expansive work area, a spacious conference room leading out to a private deck, and a kitchenette. The second floor also features an open work area, along with two private offices and a full-sized kitchen. Perfect for around 18 employees.